Let us be one of the troubled companies. Every single one of us first tries to cut down the expenses when in financial trouble. Right? We see the problems arising, sales are low, revenue is lower than expected and many other relevant indicators are showing us decline. 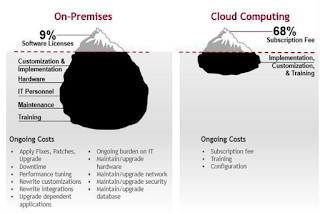 We moved our IT (being that SaaS or IaaS) from on-premises to the Cloud long before the tsunami started. We were happy enough to lower the ongoing costs, we even fired some IT stuff, not needed anymore as our IT is living in the Cloud now. Outsourced company is taking care of our IT, making services available 24/7 etc. Our mail is cloud based, Text editors and Sheets too and we are living in an IT harmony. We even went easily over the security matter of our data being "out there", because we believe those guys and we signed the agreement. All our IT is in other country as cloud is not available in ours. The costs of IT, among others, of course, are mostly based of subscription fee and staff that is configuring services for our employees. Suddenly we cannot afford to pay the subscription fee. What do we stay with? Can our company still exist and with what IT options? We download the data but what can we do with this data? Can we use it? Are we still able to do our work despite the lack of cloud services? Looking at the picture above these were the questions popping out. I am not saying Cloud is bad or on- Premises is good or vice versa, it is just we need to ask ourselves so many questions before deciding what is best for us and what will work in the future, which might not be so bright all the times after all. This does not apply to all the environments in the same way, and of course this is just aerial view on the matter, but you got the picture. So, which iceberg is larger?